A Syrian refugee family walks towards the new Syrian camp of Azraq, which stretches for 15 kilometers, and lies about 100 kilometers from the Syrian border in Jordan, Wednesday, April 30, 2014. Europeans are struggling to cope with refugees and migrants landing on their shores or having to be rescued from overcrowded unseaworthy craft amid the swells and troughs of the Mediterranean. But ground zero of the humanitarian crisis is in Libya and the neighboring countries of war-torn Syria. And there is little sympathy for European complaints of being overrun. For the past four years as warfare in Syria raged, Turkey, Jordan and Lebanon have been buffeted by huge influxes of refugees. 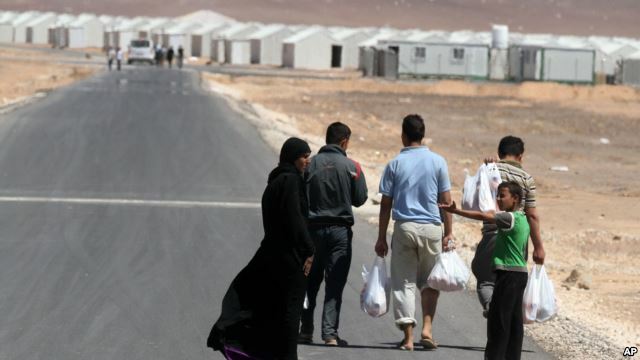 With their resources strained, all three countries have been urging Western nations to relieve the pressure on them and admit fleeing Syrians. In July, weeks before photographs of a dead Syrian toddler who drowned at sea prompted a political and media firestorm in the West, Turkish officials warned they were unable to cope with any new major influx of refugees. And they warned Europe would be faced with growing numbers of Syrians trying to reach its shores aboard people smugglers’ boats. “Turkey has reached its total capacity for refugees. Now, there is talk that a new wave of refugees may emerge … and it would put the EU face to face with more migrants," warned Turkey’s European Union Affairs minister, Volkan Bozkir. Turkey is hosting an estimated 2 million Syrians, and officials in Ankara believe the Syria refugee crisis has so far cost the country $6 billion. The EU has provided $63 million in refugee aid to Turkey, but most of that has not actually been delivered. Since March when Turkish restrictions were imposed on Syrians crossing into Turkey, many have resorted to going through tunnels guided by smugglers. And there have been several reports of Turkish soldiers firing in the direction of refugees trying to deter them. Likewise, more broadly, international aid for the refugee crisis — the worst since World War II, according to experts — has fallen far short of what the United Nations says is needed. The most recent appeal by the U.N.’s refugee agency for $4.5 billion has been met by donations of less than 25 percent. The World Food Program has had to continually cut the value of monthly food coupons, and now in Lebanon registered refugees receive only $13.50 each per month. The consequences — governments not being able to cope, massive financial shortfalls — can be seen daily in the Turkish border provinces of Gaziantep, Kilis, Şanlıurfa and Hatay, and even farther north in Istanbul. Increasing numbers of Syrians can be seen begging or hustling for casual jobs, and the socio-economic impact of the refugee crisis is clear - from a jump in crime to overcrowded housing. Resentment, too, has been building. Locals complain that Syrians are driving down wages because they are willing to work for a pittance. And there is an increasing coarseness in how refugees are treated. “Turkish businesses don’t treat us well,” said 42-year-old Mohammed, a refugee from Aleppo and father of four, who rents a ramshackle apartment in a run-down district of Gaziantep. “At the end of a day they often won’t even pay the wages they agreed,” he said. Rents also have skyrocketed - 100 percent in the border town of Kilis. Turkey’s 28 camps are full, housing 278,000 refugees. It is no different in Lebanon and arguably worse when it comes to housing. Under pressure mainly from the powerful Shia Muslim movement Hezbollah, Lebanon has refused to allow the building of refugee camps for the 1.5 million Syrian refugees who have flooded the highly unstable country. Demography defines politics in Lebanon, and fearing that camps would mean the long-term presence of mainly Sunni Muslim refugees, Shia have chafed at the prospect of the country’s demographics being altered permanently and not in their favor. It is the despair felt by the Syrians that is driving them not only to flee Syria but pushing them to escape Lebanon, Jordan and Turkey. In Libya, it is a slightly different tale — one involving Syrians less and more people fleeing sub-Saharan countries. Many are from Somalia, drawn to Libya to attempt the perilous Mediterranean crossing. But on a recent tour of detention centers in the Libyan capital, Tripoli, VOA found that most of the migrants flooding into Libya bound for Europe are just that - migrants looking for a better life and escaping poverty, and not refugees fleeing formal war. From the rate Libya’s subsidized food is being consumed, officials estimate there are a million unregistered immigrants now in Libya. Some are working while many others are hoping to cross the Mediterranean sooner or later. And this in a country that is all but bankrupt, strife-worn and torn into two warring camps. In a squalid migrant detention center in Tripoli’s Ben Ashour district, Lt. Abdul Naser Hazam says he and his guards are frustrated. But it's not so much with the migrants as it is the lack of international assistance to help improve the inadequate, insanitary facilities Libya has for detained migrants. “Western officials don’t visit here, but they should see what we have to cope with,” he says. Turkish Prime Minister Ahmet Davutoğlu picked up that line of argument Sunday, saying in a speech in Ankara that European nations should focus their efforts not on blocking refugees or migrants, but on resolving the shocks that send them fleeing and helping them so they can stay in their homelands. 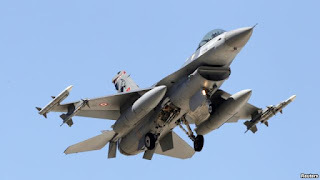 Turkish fighter jets responded overnight with airstrikes against Kurdish militants after the Kurdish fighters attacked a troop convoy near Turkey's border with Iraq and Iran. The military said Monday F-4 and F-16 warplanes struck 13 targets of the banned Kurdistan Workers Party, or PKK. Sunday's attack involved roadside bombs that heavily damaged two armored vehicles and left an unconfirmed number of Turkish troops dead. The PKK said the militants killed 15 soldiers. 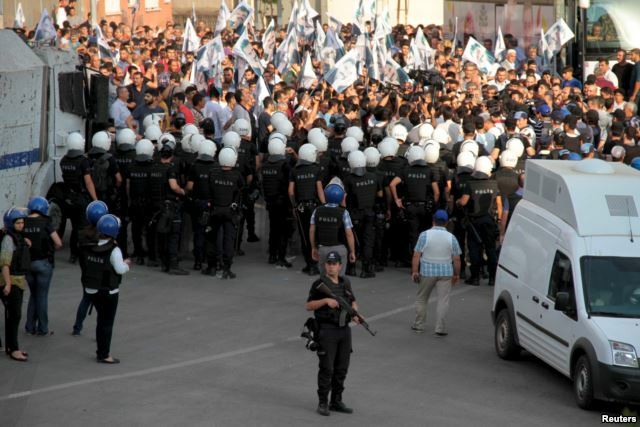 Following the attack, Prime Minister Ahmet Davutoglu cut short a trip to the city of Konya where he had gone to watch a football game and rushed back to Ankara for an emergency meeting with his security team. President Recep Tayyip Erdogan expressed sadness about news of the attack, which he said happened while the soldiers were conducting a mine sweeping operation. "I hope that with the statement of the army a new strategy will be adopted in the fight against terror," Erdogan said. "We'll continue to fight against terror with determination." If the death toll is confirmed, it would be the deadliest PKK attack since July, when violence by both sides wrecked a two-year-old cease-fire. Turkey launched what it called a new anti-terror offensive in late July with airstrikes targeting PKK targets in both southeastern Turkey and in northern Iraq. The campaign drew some cautions from the United States and European Union, which both said that while Turkey had the right to defend itself, it should show restraint and pursue a "proportionate" response. 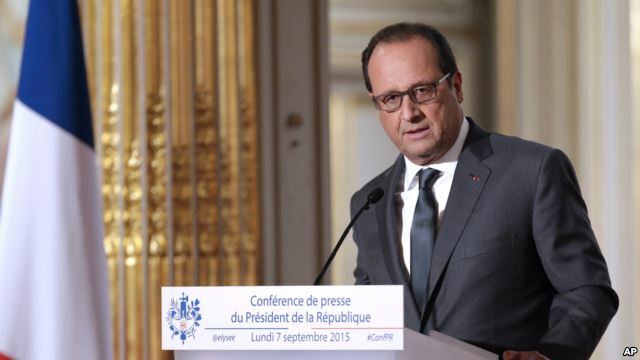 France will begin surveillance flights over Syria ahead of possibly joining the U.S.-led coalition of countries conducting airstrikes against Islamic State militants there, President Francois Hollande said Monday. French warplanes have been taking part in airstrikes targeting the militants in Iraq, but would be the first Western country other than the U.S. to participate in bombing targets in Syria. "I have asked the Defense Ministry that from tomorrow surveillance flights can be launched over Syria, allowing us to plan airstrikes against Daesh," Hollande said, using an acronym for the Islamic State group. He also made it clear that he is not considering sending French ground troops into Syria, where government troops, rebel fighters, al-Qaida-linked forces and Islamic State militants are all battling for territory. The possible expansion of the air effort in Syria follows a new development in the campaign in Iraq, where the country's own F-16 jets provided by the United States carried out their first airstrikes targeting the Islamic State group. Iraqi military officials said Sunday the jets had conducted 15 airstrikes targeting the militants who seized control of large areas in northern and western Iraq last year. "Definitely they will have a positive impact in the battles in the future," Iraqi Defense Minister Khaled al-Obaidi said. 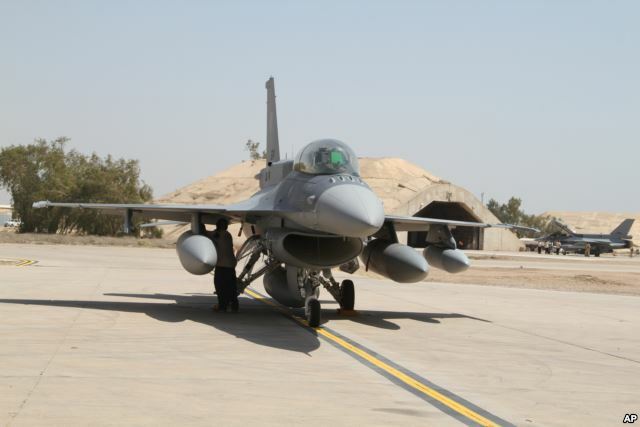 The U.S. delivered the first four F-16s to Iraq in July as part of a long-delayed contract dating back to 2011. Iraq ordered 18 of the jets that year in a $3 billion deal, and in 2012 agreed to buy another 18 of them for $830 million. U.S. Defense Department Press Secretary Peter Cook praised Iraq's air force in a statement Sunday for what he called the "successful use" of the aircraft in the year-old international campaign against the Islamic State group. "The United States is committed to building a strategic partnership with Iraq and the Iraqi people and we will continue to work with the government of Iraq on the delivery of the remaining aircraft as they become available within the framework of the production schedule," Cook said. The U.S.-led airstrikes began in August 2014 in Iraq and a month later in Syria. Coalition planes have conducted more than 4,100 airstrikes in Iraq and another 2,500 in Syria, according to Pentagon data. In addition to the U.S. and France, those participating in airstrikes in Iraq include Australia, Britain, Canada, Denmark, Jordan and the Netherlands. In Syria, forces from Bahrain, Canada, Jordan, Saudi Arabia, Turkey and the United Arab Emirates have joined U.S. warplanes in bombing militant targets. Iraqi ground troops backed by militia fighters have made some progress in regaining territory, but the militants still control much of the seized territory, including several of Iraq's biggest cities.